SIS LIVE provides broadcast connectivity for World Darts Championship. Milton Keynes, December 2015: Leading broadcast connectivity expert SIS LIVE has stepped up to the oche and extended its venue connectivity portfolio with TV coverage of the William Hill World Darts Championship in London in December and January. The critical connectivity provider of choice is already well established as Europe’s largest supplier of satellite uplinks, and has now added Alexandra Palace to its rapidly expanding list of fibre linked venues. SIS LIVE is providing main vision and reverse vision on fibre for Sky Sports’ coverage of the World Championship from Alexandra Palace, as well as satellite back-up allowing switching to ensure continuous service, if necessary. The World Championship will again be shown on Sky Sports’ dedicated darts channel, which will screen all the action from 17th December to 3rd January, to millions of viewers. This year’s event follows hot on the heels of the Rugby World Cup, which saw SIS LIVE supply all connectivity services throughout the tournament and underlined its position as the fastest growing UK broadcast media fibre supplier. SIS LIVE’s rapidly growing fibre network already connects more than 100 live event venues, with more in the pipeline. 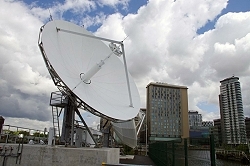 All feeds will be supported by SIS LIVE’s broadcast teleport and network operations centre (NOC) at MediaCityUK, fully backed up by SIS LIVE’s Milton Keynes teleport and NOC. Sky Sports will offer unrivalled live coverage of the 2016 William Hill World Darts Championship across TV, online and via mobile and tablet devices with Sky Go.